What makes a great Military Museum? Good question and of course there is no one answer. But whatever it is one of the many London Military exhibitions will have something for everyone to enjoy. No matter what branch of the Military you are interested in, Navy, Army, or Air force or even if the history of war and warfare, you will discover something new and interesting in at least one of these London museums. London has at least seven dedicated military museums, some are major museums and others are smaller more personal exhibitions covering a niche aspect of the subject. The choice of museum you decide to visit very much depends on your own personal taste. If you want a large collection covering Britain's military history then a museum like the Imperial War museum may suit best. However if you are interested in specific areas of the military then a dedicated museum like the Guards museum may be a better option. I have given a brief outline of each museum to help you with your choice, click through to see more information on each Military Museum. A museum dedicated to telling the story of warfare in the 20th century. Located in a old lunatic asylum, this museum brings to life the horrors of modern warfare through personal stories, interactive experiences and poignant exhibits. A close up experience with over 100 real aircraft on display. This museum is very much designed to be a family day out as well as an educational visit. The museum is set in 10 acres of land with aircraft displayed both outside and inside giant hangers. This is a great day out and the displays are simply stunning and really do make you feel close to the action. Covering the history of the five foot guard regiments, the grenadier, Coldstream, Scots, Irish and welsh Guards. This museum celebrates the role the Guards have played in military campaigns as well as many ceremonial roles in London. This museum explores the history of military weapons from the slingshot to the supergun. The museum is situated where the Royal regiment of artillery were first formed over 300 hundred years ago. This museum is backed with military hardware which will delight every military enthusiast. The story of the gunners as they were known is told via interactive displays as well as archive images and personal stories. This is a living museum which gives you a "behind- the-scenes" look at the Household Cavalry Regiment day to day work and shows visitors what it takes to prepare for their ceremonial and operational roles. The setting of the museum could not be more appropriate or engaging as it is situated right in the heart of London at the barracks themselves In horse Guards parade. This museum differs from the Imperial war museum as it focuses on the actual solders rather than the machinery and warfare itself. The exhibits look at life for soldiers through the decades and various battles, from the archers at Agincourt to the solders during the cold war. It also covers the role of women in the army and how it has changed and developed. If uniforms rock your boat then this museum will not disappoint as there are many on display, alongside model mock-ups of battle scenes. 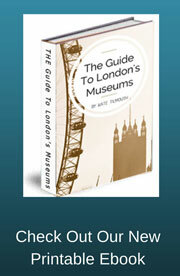 A truly interesting museum in the heart of London's well heeled Chelsea area. This is not so much a museum but a preservation of a historic site. 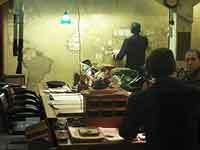 These underground bunkers were the actual war rooms where Winston Churchill and his war cabinet planned and orchestrated the second world war. The rooms have been preserved as they were during the war and as you move through the museum you will be able to see rooms such as the Prime Minsters bedroom, the map room and the main cabinet war room. There are supporting displays which show the day to day drudgery of living through the war as well the Churchill museum which tells you more about the man himself.